Directory of 29 South Dakota Prairie Dog hunting lodges, guides and outfitters in South Dakota. Your Prairie Dog Hunt is all inclusive... 4 night/ 3 day stay in our main lodge and/or chalet, on-site transportation, all meals, dinner wines, all beverages, and daily maid service. Trap and target range will be available for your use. Bring your own rifle benches or use ours. Prairie Highlands Outfitters main goal is to provide you with the best hunting experience possible. Our 3200 sq. ft. log lodge sleeps 10 and includes a wet bar, pool table and lounge. We also offer two log cabins with full kitchens and bathrooms for a more private stay. There is a natural hot spring just feet from the main lodge. We provide hunting packages for prairie dog, whitetail, mule deer, pronghorn, turkey, grouse, prairie chicken and coyote hunting. 2,000 private acres and access to over 1,000,000 acres of tribal land your sure to have a blast. Prairie dog hunting with Routier Outfitters is an absolute blast and hunters have access to over 50,000 acres. No real early mornings and no pressure of finding the "big one". You well stay in a hotel in Buffalo called the Tipperary Lodge and we will meet you in Buffalo and load up all of the guns, gear and snack cooler and head out. We have several prairie dog towns that we hunt so you are not stuck in one place the entire time. Once we are at the prairie dog town a canopy is set up to provide shade on the hot summer days. Shooting benches and chairs are set out and the fun begins. The packages we offer are all inclusive and include all the luxury and amenities one can expect when visiting Thunderstik - South Dakota's premier 5-star hunting lodge. If the timing is right, add in a day or two of walleye fishing for a cast and blast or some fall Pheasant Hunting for a Combo Hunt. View our website for prices and packages. The Prairie Dog package is fast becoming one of our most popular hunts. We offer thousands of acres and over 50 different prairie dog towns for our guests. You are guaranteed not to see the same town twice except by request. Our hunters typically shoot around 250 to 500 rounds a day (sometimes more!). Prairie Dog hunts start in May and run thru June 30th. Numerous 40-50 acre prairie dog towns and also 750 acre plus prairie dog towns. Portable shooting benches, sandbags, and guide are provided--along with daily refreshments in the cooler. Our season runs May 20 thru the Summer. Packages include lodging. Coyote and Prairie Dog Hunting offers an enjoyable way to spend the day. Early mornings work great for calling in coyotes we can then finish out the day prairie dog hunting. Self-Guided: Daily Rates--Prairie Dog = $100.00 per gun Semi-Guided Packages: 3 Day $900.00 per gun; 5 Day $1500.00 per gun. 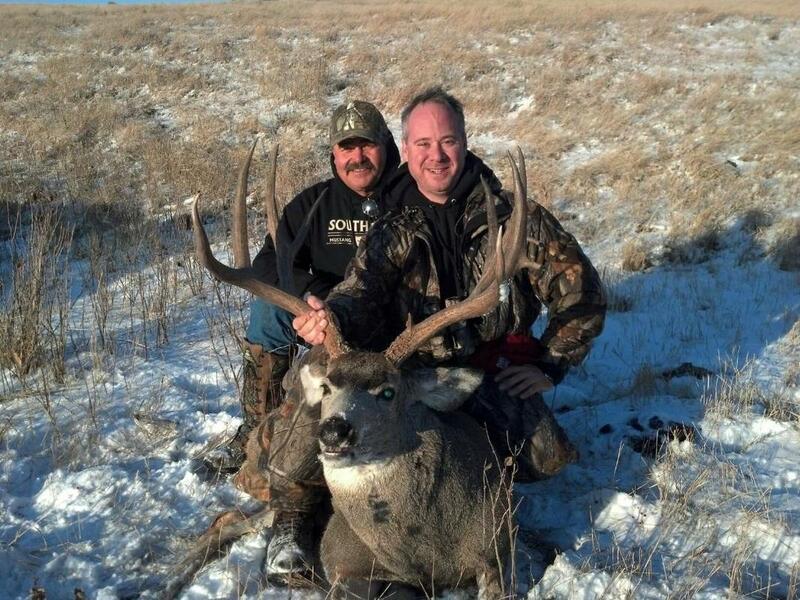 These hunts are on the beautiful rolling hills of western South Dakota. The weather is very warm this time of year. This is a great opportunity for the hunter with pointing dogs. Prairie Dog shooting and Large Mouth Bass fishing can be included on these hunts. You will normally shoot between 300 and 500 rounds per day. This hunt can be as intense as you want to make it. If you want to shoot from dawn until dusk, that is fine with us. If you plan on shooting this many times, you may want to think about bringing an extra gun. We've seen a lot of barrels ruined from over-shooting. Dozens of Prairie Dog Towns, Thousands of Acres, private land, 200 to 500 Rounds Per Day Per Hunter. Package Includes Hunting, Lodging and Meals, Shooting Benches, All Taxes and Fees, One Free Night Included. Grand Prairie Plantation is a family owned lodge in the heart of South Dakota outdoors. All our prairie dog hunting groups can be in the field just minutes from the lodge. Our lodge sleeps 8, full kitchen and bathroom. Bird cleaning is indoors dog kennels available. All hunters buy a tribal license which give them access to over 800,000 acres. Please email any questions. We also offer Prairie Dog packages from June 1-November 1. Prairie Dog packages include meals, lodging and in hunt transportation. We can set up within 200 yards of prairie dog towns or set up out past 500 yards for a real long range challenge. You can add predator hunting to the prairie dog package at no cost. We will typically go after the coyotes at first and last light. The midday hours will be saved for prairie dog shooting. We will stay in hotels in local towns on these hunts. The eight mile drive over hilly terrain and through the picturesque breaks to the Medicine Creek Ranch Lodge is both scenic and exhilarating. As the road winds down to the dense tree lined Medicine Creek bottom and wildlife from deer to porcupine come into view, you’ll know you have reached some of the best secluded hunting available in our fine state of South Dakota. Prairie Dogs are abundant in our area. Expect to shoot an average of 200-250 rounds a day at ranges from 50 to 200 yards and further if wanted. We provide some shooting benches but you are welcome to bring your own. Wild ring neck pheasants hunting, walleye fishing on the missouri river, prairie dog hunting, archery deer, water fowl hunting spring or fall, James River fishing, perch on lake dudly or any combination of these wonderful outdoor activities are possible. Learn more about Pheasant Phun, Inc.
Prairie dog hunts are offered in addition to a variety of other hunts, lodging and meals. Rolling Green Outfitters has been serving pheasant, prairie grouse and prairie dog hunters since 2009. A family run operation with a family run atmosphere located in beautiful Stanley County South Dakota. A thriving agricultural region provides ample food and habitat with such crops as Grain Sorghum, Sunflowers, Corn and Wheat. All prime food sources for upland birds and deer. Our family has been providing top quality hunting since 1997. We have some of the finest hunting ground around. For hunts we provide: pheasant, deer, and even prairie dog hunting. We send a hunting guide and dogs with you on every hunt. You are also welcome to bring your own dogs with you. South Dakota is one gigantic hunting preserve, a mixture of farms, ranches and some of the world's friendliest people. South Central South Dakota has been labeled "The Pheasant Capitol of the World" and for good reason. No other region compares to the wild pheasant numbers found in this part of the State and South Dakota has a reputation for pheasant hunting second to none. Our prairie dog hunting package includes transportation to and from the dog towns, lodging and meals. These hunts are sold on a daily basis at a rate of $350 per person per day. We also offer a discounted hunt that does not include lodging or meals but does include transportation to and from the dog towns. Cost is $250 per day per hunter. T-Bone's Treehouse is located in south central South Dakota. Winner is commonly known as the “Pheasant Hunting Capitol of the World”. T-Bone's Treehouse offers a much wider variety of hunting and fishing, including but not limited to; Deer, Prairie dog, Pheasant, Walleye, and Bass. If you are looking to stay out of the city, but close to amenities that a small town offers. Have a little bit of patience and a large rifle? Well book a prairie dog hunting trip today! Our prairie dogs are a blast to hunt. We offer 2 prairie dog towns, each with an overlook that is perfect for setting up camp for the day. When you feel like it, you can move to the other where the prairie dogs are ready to be hunted. South Dakota is home to plentiful amounts of prairie dogs. The pastures of the west are home to towns that contain sometimes thousands of "sod-puppies". Hunting for them is not only an exciting way to hone in your shooting skills during the summer months, but it is also an excellent tool in the process of land management. Y Question Outfitters has begun Prairie Dog hunts as of 2007. If you want to shoot varmints, you'll find some of excellent land. They have even hunted them with open sight muzzleloaders. Bring plenty of ammunition.